If you've already read yesterday's interview with Kahani founder Lisanne, you'll know that the label's handcrafted, luxury scarves and shawls are created using age-old techniques, on the highest quality fabrics, by highly skilled, indigenous artisans in Kutch, India. Each and every item in the Kahani store possesses an appeal of timeless quality that can be worn with the knowledge that the craftsmen who created it were paid a fair wage and worked under ethical conditions. I'd say that's pretty awesome, wouldn't you? 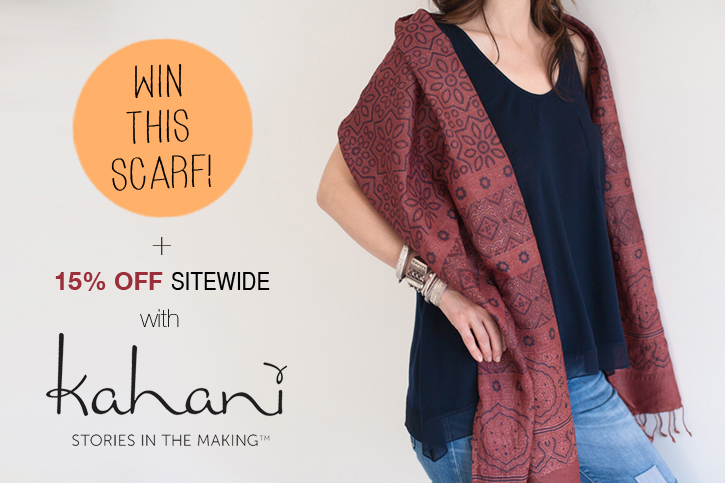 So to spread some of this awesomeness around, Wandering Threads has partnered with Kahani to give you the chance to win your very own Tussar silk Ajrakh block printed scarf, worth $85! 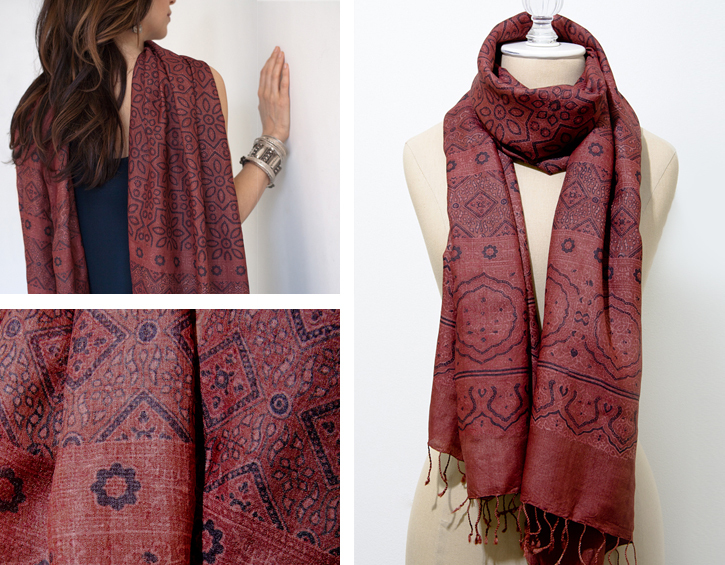 This particular scarf (as pictured above and below) is created using a form of traditional hand block printing and resist dyeing done using natural pigments. It's a laborious process that requires several stages of preparation, printing, drying, dyeing, re-printing, re-dyeing, washing and so on. In fact, a traditional Ajrakh cloth can take up to three weeks for the desired colour and pattern to be achieved! If you'd like to be in with a chance of winning this beautiful scarf, and owning your own artisanal creation, simply follow the instructions below. The contest is open to entrants from around the world, so go on, enter now! 3. Share Kahani on your own blog. how you have entered, providing links if necessary. For a limited time only, the very generous people at Kahani are also offering 15 % off all items, store wide, from the 11th -30th July 2012. Just enter 'WANDERINGTHREADS' at checkout to get your discount! Contest runs from 11.07.2012 to 30.07.2012. Winner will be picked at random by Kahani and notified through the method they have entered (Facebook/blog/Pinterest. I already have some products of Kahani (scaves and jewelery). You won't be desapointed if you buy something from Kahani! I just LOVE my scarves ; ) long life to Kahani! I have liked both Kahani and Wandering Threads on facebook and pinned five of the many beautiful scarves and shawls from Kahani! Too beautiful! I have pinned 5 items on Pinterest, I have liked Kahani on Facebook too already. I have liked both with facebook and although I tried pinning, pinterest would not let me pin directly from Kahani's site. I am currently living in India and working with Natural Dyers and Block Printers. Though I have yet to get my hands into tie and dye. The work of Kahani is exquisite!